Magento Suggest Friends : Magento Suggest Friends is very useful Affiliate module by which sales of your store will increase. User share the product to their social network after purchase through social network, Referrer get commission. Magento Suggest Friends - Magento Suggest Friends is very useful Affiliate module by which sales of your store will increase. User share the product to their social network after purchase through social network, Referrer get commission. It support for 4 social networks. After the module installation, you need to configure the module for all the social media networks. In the back-end, admin will enter the Social Media Network ( say Facebook) App id and referrer commission. 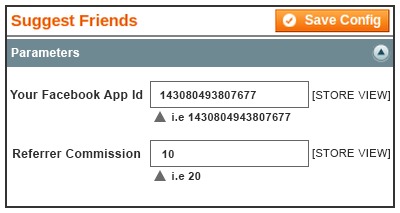 Admin can also view the referrer's commission and their email id under “Suggest Friends” tab in the back-end. Admin will enter Social Media Network App id. Admin will set the commission for the referrer. Admin can view the referrer's commission and their email id. After the module configuration from the admin's end, customer can view various Social Media network links on the product page. When the customer shares that product on their Social Media Network and if any sales is done then the customer or the referrer gets the commission set by the admin. There will be an additional tab in the customer's account called “ My Suggestion” through which customer can view all their total commission and email ids. There are various Social Media network links on the product page. Customer can shares that product on their Social Media Network. Customer can view all their total commission and email ids under “My Suggestions”. 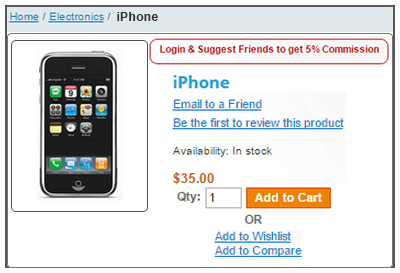 Did you buy Magento Suggest Friends?